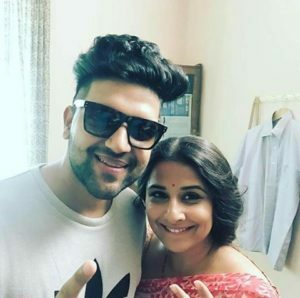 Here’s some cool music news for the upcoming film Tumhari Sulu, starring Vidya Balan. You probably know, singing sensation Guru Randhawa from his mammoth chartbuster, ‘Suit Suit’ when it was recreated for the film Hindi Medium. In fact, the song became an even bigger hit than before. Now the boy from Gurdaspur is set to see his other hit, ‘Ban Ja Tu Meri Rani’, which boasts of more than 25 million online views, make its way into T-Series and Ellipsis Entertainment’s forthcoming family comedy-drama, Tumhari Sulu. Stay tuned because, the romantic number (‘Ban Ja Rani’), picturised on Vidya Balan and Manav Kaul, will release on October 16.